Developed by minority languages experts and community groups across Canada, Canadian Heritage’s Frame of Reference for the Vitality of Official-Language Minority Communities establishes a number of factors that are key to ensuring the vitality of minority language communities. The Action Plan for Official Languages – 2018-2023: Investing in Our Future is the Government of Canada’s official languages strategy for the period from April 1, 2018, to March 31, 2023. 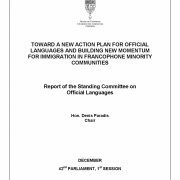 It outlines the Government of Canada’s vision for supporting official-language minority communities and promoting our two official languages. The Action Plan for Official Languages delivers an investment of $499.2 million over the next five years and outlines new initiatives to support the two official languages. It is based on three pillars: Strengthening Our Communities; Strengthening Access to Services; and Promoting a Bilingual Canada. 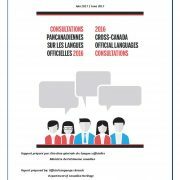 In 2016, the Minister of Canadian Heritage (PCH) Mélanie Joly oversaw the Cross-Canada Official Languages Consultations, a step in the Government of Canada’s development of a new multi-year action plan for official languages. This final report presents key findings from the roundtables, an online survey, and various briefs and written submissions received by PCH. 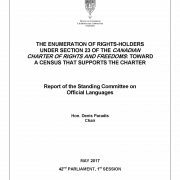 The House Standing Committee on Official Languages (LANG) this morning presented its fifth report related to the enumeration of rights-holders under section 23 of the Canadian Charter of Rights and Freedoms.  The QCGN and the Quebec English School Boards Association (QESBA) appeared together as witnesses on February 16, during the report’s study phase. The report makes the following recommendations, which support our community’s interests. Recommendation 1: That, pursuant to section 23 of the Canadian Charter of Rights and Freedoms, the Government of Canada work with the provincial and territorial governments, official-language minority school boards and other community stakeholders to develop and fund a national awareness and outreach campaign to inform Canadians about their constitutional rights in education and the language options available for their children’s schooling. Recommendation 2: That the Government of Canada recognize it is responsible for collecting complete data on rights-holders subject to section 23 of the Canadian Charter of Rights and Freedoms and commit to obtaining a complete portrait of rights-holders by 2021. Recommendation 3: That the Minister of Innovation, Science and Economic Development ask Statistics Canada, as part of its preparation for the 2021 Census, to establish an advisory committee specifically mandated to examine the enumeration of rights-holders under section 23 of the Canadian Charter of Rights and Freedoms. Recommendation 4: That the Government of Canada require Statistics Canada to include questions in the 2021 Census that would allow for the enumeration of all rights-holders under the broadest interpretation of paragraphs 23 (1) (a) and (b) and subsection 23 (2) of the Canadian Charter of Rights and Freedoms. 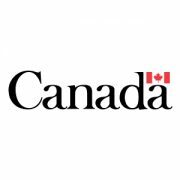 provide Statistics Canada with the necessary funding to conduct this survey, analyze the data and distribute products derived from the survey. Recommendation 6: That, as part of the new survey on the vitality of official language minorities, Statistics Canada establish an advisory committee that would include representatives from anglophone and francophone minority communities. 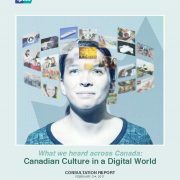 This report presents the findings of the Canadian Content in a Digital World consultations that took place during Fall 2016. The report is a synthesis of feedback collected by Ipsos via the online portal, in-person events and social media discussion as well as mail and e-mail submissions received by the Department of Canadian Heritage. The department initiated this consultation process to review the current measurs taken to ensure that Canada’s culture remains strong and competitive within the global landscape. Following the series of consultations made by the Department of Canadian Heritage, the Committee’s objective was to identify Canadians’ priorities with regard to official languages and, more specifically, those of official language minority communities (OLMCs), in order to make recommendations for the development of the new action plan. Education in English: It’s About You! Know your Rights! 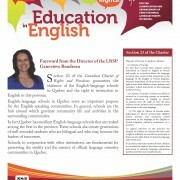 Produced by the Language Rights Support Program, this flyer/insert for community newspapers discusses the right to education in the language of the minority with interviews with Walter Duszara, Secretary of the QCGN Board; Carol Meindl, Executive Director of the Quebec Federation of Home and School Associations (QFHSA) and David D’Aoust, President of the Quebec English School Boards Association (QESBA). https://qcgn.ca/wp-content/uploads/2016/09/Insert-education-LRSP-1.jpg 4092 3366 QCGN Communications https://qcgn.ca/wp-content/uploads/2015/11/qcgn-pan-trans-white.png QCGN Communications2015-04-13 16:05:142016-09-23 13:50:22Education in English: It’s About You! Know your Rights! 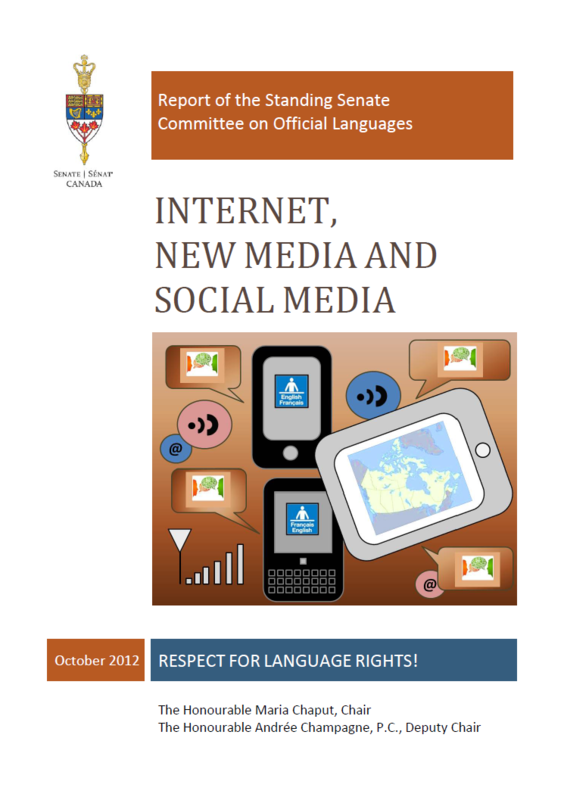 Following testimony from more than 50 groups and individuals, the Senate Committee recommended that the Government of Canada make a clear commitment to respect Canadians’ language rights on the Internet and in new media and social media, regardless of their status or where they live. The report sheds light on how much both official languages are used in an environment where new technologies and Web 2.0 are gaining in popularity. 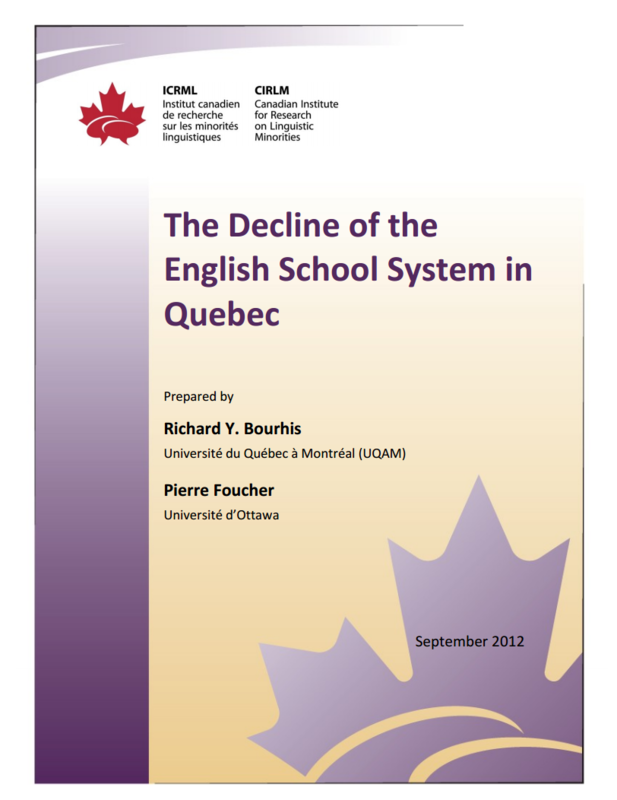 This Canadian Institute for Research Linguistic Minorities report by Richard Y. Bourhis and Pierre Foucher deals with the declining demographic vitality of the English speaking communities of Quebec and documents the 50 per cent decline of the English school system suffered since Bill 101. The report highlights the debate surrounding Bill 104 and Bill 103 further limiting access to English schools in the province. It states that Francophones are a secure dominant majority in Quebec while minority Anglophones need collective rights to protect their vitality. 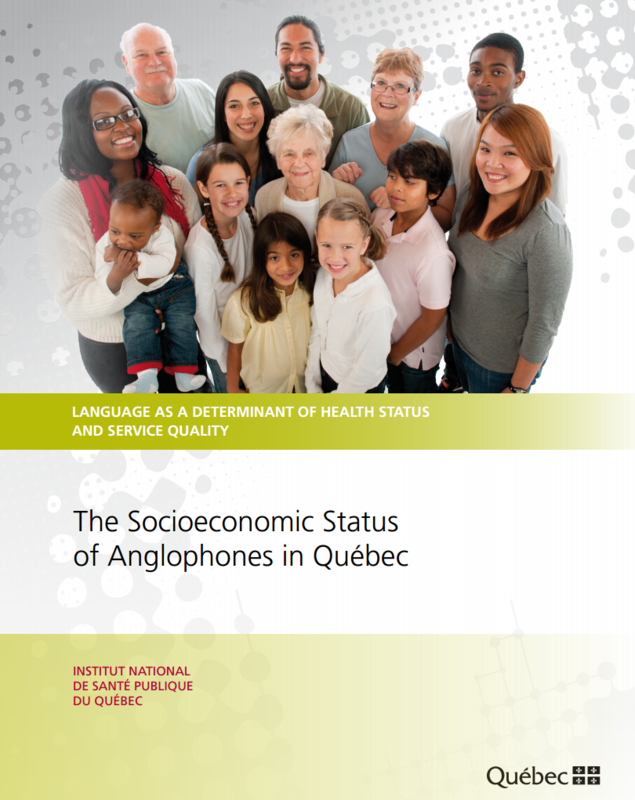 As part of a wide-ranging project to study the health status of Quebec’s Anglophones, this analysis by the Institut National de Santé Publique du Québec examines the Anglophone population’s socioeconomic situation over time, by geographic area and in comparison with Francophones. The analysis brings to light not only that Anglophones have lost a relative socioeconomic advantage in comparison with Francophones, but also the widening gaps within the English-speaking population.